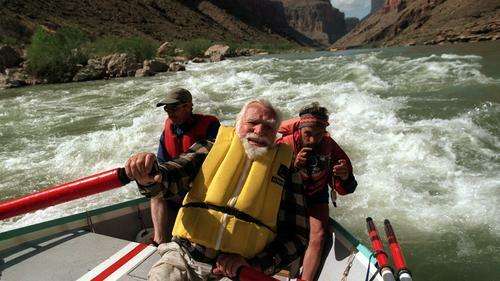 The recent passing of Colorado River Legend Martin Litton turning my thinking to "Age." It's been that way since we were a little kid. Maybe it's been that way for you, too, eh? Remember in grade school when 8th graders seemed SO much older (and possibly wiser) than us? Remember your freshman year in high school when Seniors seemed so mature? Why we thought we'd never live long enough to become a Senior! I will never forget my first real job away from home in 1966. It was the summer of 1966 after my freshman year at Purdue. I worked on a federal Bureau of Public Roads field survey crew in SOCAL's San Gabriel Mountains. I lived in a cheap apartment in Azusa, California, with some of the other crew members. Our crew boss was 23 years old. At the time, I was a mere 18 years old. I looked at that 23-year-old and thought he was like REALLY OLD! I often wondered what it would be like to be 23. That whole pattern has continued through my life. Back in 1983 when I took my Mom and Dad on their one and only Colorado River trip through Grand Canyon, I thought my Dad seemed imposisbly old. Heck, he was only 61 years old at the time. When I met Martin Litton, Martin seemed like a genuine fossil. And get this, Martin was 66 years old when I met him, a year younger than I am as I write this commentary. I will never forget being in the editing booth with some SRP video technicians watching video of Martin rowing a dory in Grand Canyon. All of us were marveling that such an Old Man could accomplish such a feat. HA! A few years back, I turned 60. Frankly, I was feeling pretty low about passing the 60 milestone. 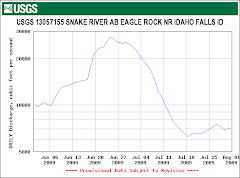 I had just taken a paid job as Director of The Eastern Idaho Retired & Senior Volunteer Program (RSVP). I felt like a fossil. Well, the average age of the roster of 700+ volunteers I managed was 74. And there there hundreds of them in their 80's and a heck of a lot in their 90's. The 80-somethings were fond of coming into my office to cast a wary eye on me. I thought it was kind of odd that they would do that. Finally, one of the 80-somethings said, "I didn't know they were going to hire a kid to do this job." That guy's comment was a revelation to me. He was looking at me the way I was probably looking at 40-somethings back then. Suddenly, I didn't feel 60 any more. It was quite a liberating moment. It should go without saying that we are all whatever chronological age we are today and forever. However, it should also be noted, that our own chronological age is just a number. It is whatever lies in our Hearts and Spirits that matters. Today, we are going to visit the Youngest almost-90-year-old Dear Friend we know. For her, 90 is the new 70. Heck, for her, 90 could be the "new 60." She is not bound by the constraints of being almost 90. Nope, she acts, talks, walks and lives like every moment of every day is fresh and full of fun just for her. We know it's only a natural human tendency to assess people as being either younger or older than ourselves. We know that will never go away. We also know that most younger people look at me and think, "Gee, what an old guy." But you know what? We don't care what they think? We don't spend a nano-second even considering their thoughts are about our age. Whenever we misbehaved while growing up, our parents would often deliver a stern admonishment to "ACT YOUR AGE!" Well, we probably have never acted our age and don't plan on starting any day soon. We may be 67 years of age but we feel totally free and entitled to act whatever age we may wish on any given day for any reason whatsoever! And that's the way it is with AGE. As I approach 70 this year, your article was especially relevant to me. Of course, the first part of the story caught my eye. I was the class of 1963 in Azusa, California. I spent many years as a kid hiking in San Gabriel canyon. Six degrees...as they say. Love this John! Absolutely love it. Thank you. We are going to the Ginfest tooight in Martin's honor at Brad Dimmocks. Sending this to my 83 year old dad, an RSVP member for San Diego police at Balboa Park and downtown!